Early records indicate there was an elementary school at Valley Falls, likely associated with the mill at that location. Brookes in "Cascades and Courage" mentions Valley Falls as one of the earliest schoolhouses. 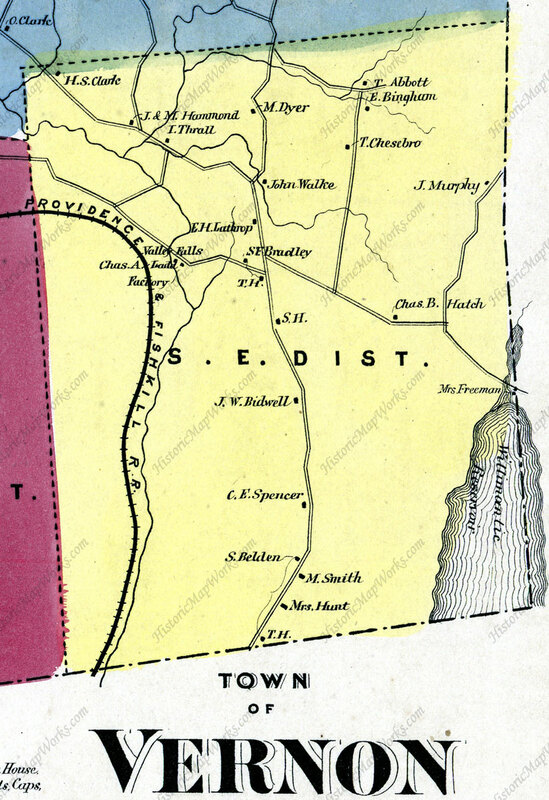 1869 OW Gray map of Southeast District. We know little about this schoolhouse, long out of memory, but can make a few educated guesses. The first sawmill at Valley Falls was in operation in 1740. Over the years there were a succession of mills at this location producing flaxseed oil and cotton until the last mill was destroyed by fire in 1877. Our first meetinghouse was built in 1763 and records indicate our first schoolhouse followed soon after and was located nearby. Reverend Ebenezer Kellogg in his description of 1800 Vernon says there were six school houses at that time. Although he does not list the schools it would likely have included the Valley Falls school. As the mill community was well established when the meetinghouse was built this might have been the second schoolhouse in North Bolton. On May 2, 1843 the Southeast School District purchased a small triangular piece of land on Bolton Road from Albert G. Dart for $10. The school was already on the lot. See property description under Sources. The 1853 and 1869 maps of Vernon show nine school districts and the location of their schools. The Southeast District school is shown on both maps on the east side of Bolton Road a short distance south of the intersection with Valley Falls Road. These are the only maps that locate the school. They may have chosen this location because was on a main road and there was a spring nearby, later used by the Beach family. The maps indicate the school was at a slight bend in Bolton Road. The east side of Bolton Road is steep, part of the eastern wall of Railroad Brook, not a good location for a school near the road. Is there anything at that location that would indicate the possibility of a school there? Indeed there is a flat spot at that bend in the road at 534 Bolton Road. It appears gravel may have been removed from the hillside, perhaps to build or shore up Bolton Road. It left a level lot large enough for a small school. There are a number of stones on the lot, but nothing that would prove a school was there. The trees present are secondary growth, none likely older than 1880.
other Vernon schools of the period. Brookes says that in January 1870 the number of students between ages 4 and 16 in the Southeast District was 26. In 1878 the number was 23. The 1902 Selectman report shows it has declined to 14 and the town is wondering whether to keep it open beyond the next year. This tells us that the number of students was probably never very large and that the school was still in use in 1902. Recall that the last mill burned in 1877 so it was likely that mill workers were moving to Rockville to find work, further reducing the population. There are no sketches or photos of the Southeast School but a composite 1895 photo shows schools existing at that time. Several share a similar design so we might guess the small, likely one room, Southeast School would be similar. From the 1843 property description a fence ran along the road in front of the school. Vernon sent a committee to visit and inspect each school annually. The 1902 report for the Southeast District says, "So afar as the school is concerned here both in teacher and management we have no fault to find, the building is comfortable and in fair condition. The school was good but the attendance was very small. The joint board have thought best to appropriate the same amount of money for another year hoping that the attendance may be increased." The teacher that year was Gertrude Herskell. After the Valley Falls Factory closed in 1877 the school age population dwindled such that each year for almost twenty years the School Committee wondered whether it was time to close the school. There seemed to have been just enough students to justify the one teacher. Finally it was taken out of their hands and the end came suddenly in 1911. The Southeast district school building in Vernon, located on the Bolton Road, was totally destroyed by fire Saturday night (January 28). The fire started about 8 o'clock. There was a heavy wind, and although several people were promptly at the scene of the fire, the building was in ruins in a short time. The origin of the fires is unknown. The building, which was a frame one, was insured for $300 through the agency of Arthur T. Bissell of this city. There has been no school in the Southeast district schoolhouse for several years, the scholars in the district being conveyed to this city, where they attended the East District school. Likely schoolhouse site. Road is to left. Note flat lot with steep wall on right. 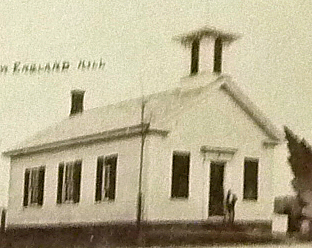 For the next few years the School Committee considered rebuilding the school in the Southeast District but in their 1913 report wrote, "Ever since the school house in this district was destroyed by fire several years ago, the plan of transporting the pupils to the East District has been followed. Results have been so satisfactory that there is no thought of rebuilding." In 1914 the town voted to consolidate several of its school districts and to assume control from the School Committees. On December 20, 1916 the Southeast School District property on Bolton Road was transferred to the Town of Vernon. The Quit-Claim Deed describes the property as "bounded on the northerly, easterly and southerly sides by land of Allen R Lathrop, and on the westerly side by the highway leading from Vernon Center to Bolton." 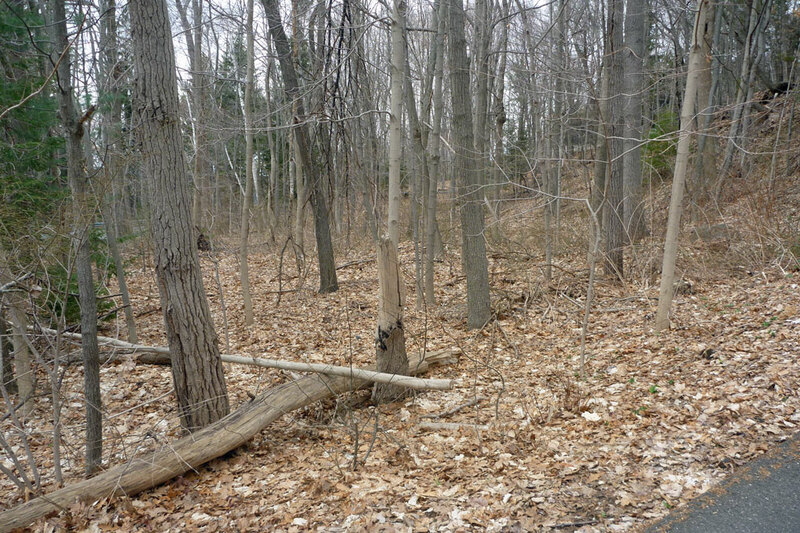 The property likely became part of the Beach estate soon after and returned to woods. The Beaches began buying property in 1915 and in 1917 bought 103 acres on Bolton Road from James Bidwell. In 1958 Charles Beach sold the last 225 acres to Jones and Lyons, real estate developers from Old Lyme, CT. In 1974 Lee & Lamont Realty subdivided the property and a series of homes were built on the hillside east of Bolton Road. After a hundred years there is little to show there was ever a school on Bolton Road. Perhaps one day some archeology work will be done to see what remains. "Cascades and Courage" by George S. Brooks, 1955, 529 pages. This is the classic local history book. It contains a chapter on education and is the basis for this article. The entire text can be found and searched online. Vernon Land Records, Vol. 3,464 1843 description of the property, "A certain piece of land situated in Vernon aforesaid described as follows, beginning at the heap of stone in the turn of the fence about two rods north of the school house in said District, hence running Easterly as the fence now stands about three rods to stones, thence Southerly as the fence now stands about thirteen rods to the highway containing about nineteen rods of land ??? the same more or less, being the same land which is now thereon out?? for a school house lot in said District." Note: 1 rod = 5.5 yards or 16.5 feet so the property was a triangle about 50' x 215' on a curve with the road as the third side. The area was 19 square rods or 5,172 square feet or .12 acres. Not much larger than the school itself.